Hello Tatertots & Jello readers! I’m SO EXCITED to be guest posting here today! Thanks so much Jen for having me. 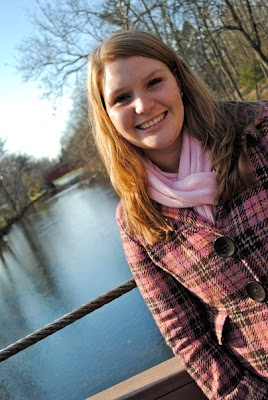 My name is Rebecca and I blog over at My Girlish Whims about beading, crafting, and general life as a girl! My favorite craft of all time is jewelry making. With Valentines Day right around the corner, I thought I would whip up a girly necklace with Valentines Day colors! The first thing I did for this necklace was gather up some red, pink, and purple beads. 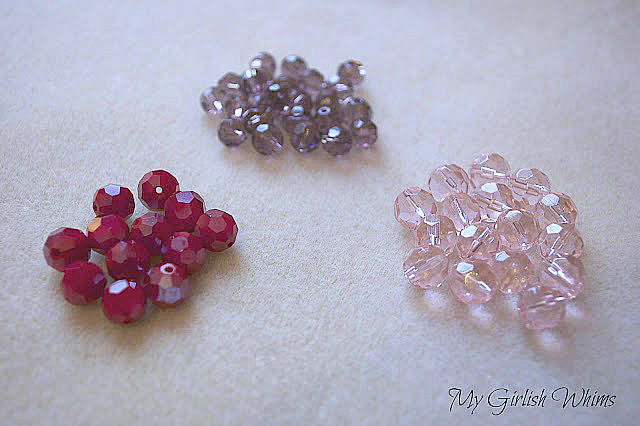 The red and pink beads are from Michaels – they are faceted acrylic beads in size 8mm. The purple beads are 6mm that I found in my own stash. The findings you will need for this project are chain, head pins, a clasp and jump rings. Make sure your chain has medium size links (do not want a fine chain for this project). All these supplies can be found at a basic craft store. The tools needed for this necklace are needle nose pliers (I prefer bent-nose needle nose pliers), wire cutters, and round nose pliers. The first step is to cut your chain to length for the base of the necklace using wire cutters. Next, grab a head pin and string on a purple bead. Find the center of your chain and insert the head pin through the center link. Squeeze the loop shut with needle nose pliers. The last step then is just to attach a clasp to the back of the necklace. To do so, use a jump ring to attach the clasp to the chain. I used a lobster claw clasp so the other side just needs a larger jump ring to grab onto. Use needle nose pliers to open the jump ring to the side, attach the end of the chain and the clasp, then close it back up. Do the same for the jump rings on the other side. After the clasp is on, connect it and you are done! That wasn’t so bad now, was it?? The great thing about this necklace is that this version is fun and girly and great for Valentines day, but you could easily make a version with all black beads or with a different color scheme for a classier look! I hope you enjoyed the tutorial! If you’re interested in jewelry making or other girly crafts, be sure to visit my blog and say hi! I am so excited to make one of those necklaces to wear this Valentine’s Day!! Isn’t she cute?? She is 21 and a newlywed. 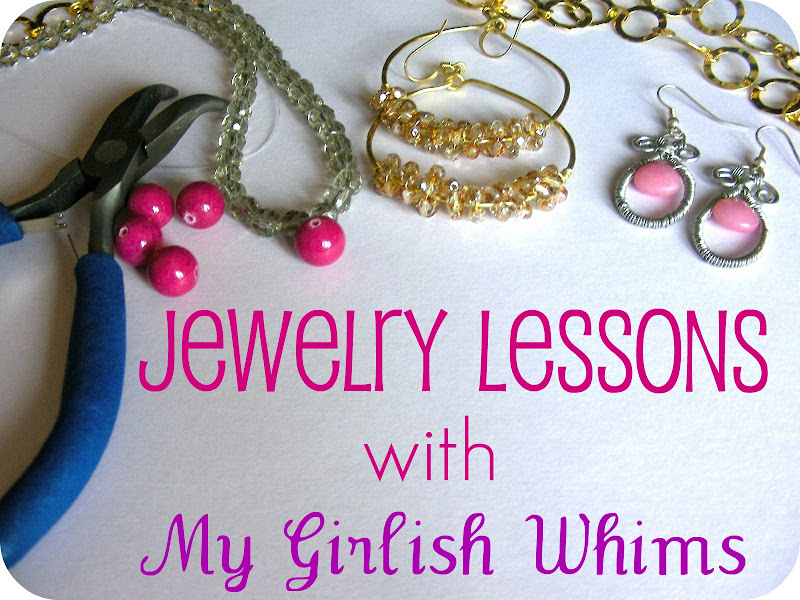 If you’ve never made jewelry, be sure to check out Rebecca’s Jewelry Lessons! There are all kinds of posts, from where to buy beads, to how to make earrings, how to crimp beads and more. 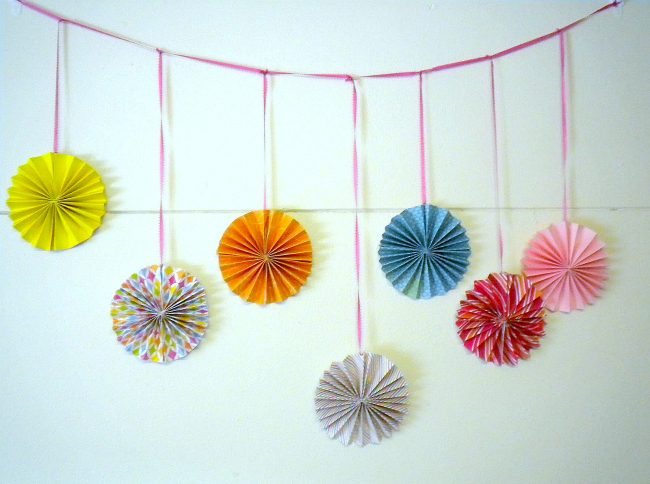 Rebecca made this Paper Fan Garland to hang above her bed. Be sure to head over to My Girlish Whims and follow along with Rebecca in all of her newlywed adventures!! 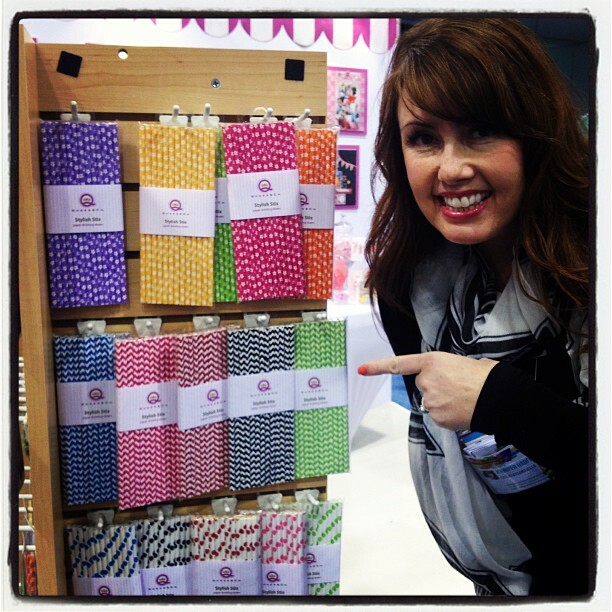 PS — I had such a fun time at CHA!! I picked up some awesome prizes for the giveaway. And I am working on some FUN Valentine’s Day projects to share. I can’t wait to tell you more!! Guest Project — Anthropologie-inspired Bib Necklace!! Gracias, un trabajo muy hermoso y como lo describes, es muy pero muy fácil. WOW! the necklace is so pretty and stylish too. This is such s creative idea I must say. I will try to create it at my home for sure. Can’t wait to check out this blog. I have a love/ hate relationship with jewelry-making, so I’d love to learn how to make it more do-able (more love, less hate). Isn’t she?? I am so excited to try her tutorial – that necklace is so pretty! Thanks for the comment Mimi!! Super sweet tutorial! Loved it.